How do I get my allowance? Option 1. When you submitted a copy of the award to the school, the school could have submitted to CHEDRO its billing with your name as one on the payroll. When the schools receives the allowance for a group of students, the grantees/scholars are required to sign the payroll and claim the excess amount if the allowance is more than his/her outstanding balance for the semester. Option 2. 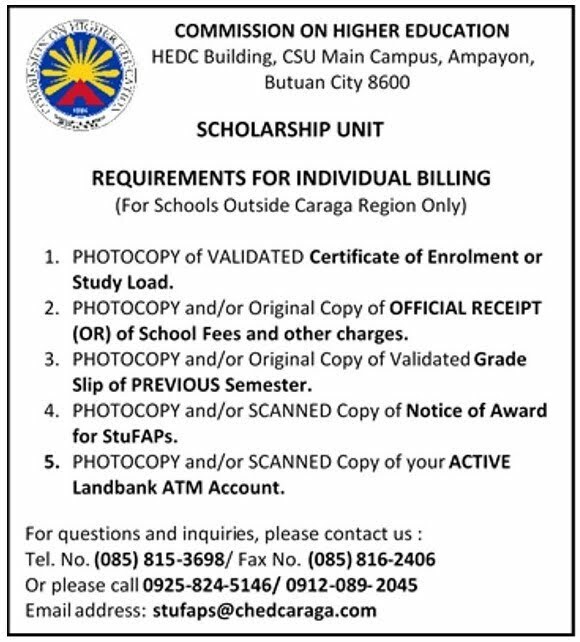 For students whose school did not submit a bill to CHED Caraga, specially for those studying outside Caraga Region, you may submit your billing documents consisting of the following, in certified copies: 1) Certificate of Enrollment, 2) Official Receipt/s of payment to school, 3) Statement of Account, or and Enrollment and Billing Form (EBF) which contains already the combination of information needed. The student needs to submit a photocopy of his LandBank ATM card to facilitate payment by deposit which is possible once the student agree tp shoulder the Interbranch Deposit Charge by LBP, if applicable. The second and succeeding billing should include the copy of the previous semester grades.